✅ PEACE OF MIND - Car theft rates are on the rise. Some 89000 cars were stolen last year in the UK. Our Cloakmate Signal Blocking Pouch will stop thieves from being able to amplify your car key signal, and thus unable to access your car. Your vehicle will remain protected. ✅ DESIGN EXCELLENCE - We believe in keeping things simple and intuitive. Cloakmate pouches have a single pocket for security and ease of use. Other available pouches often contain additional compartments that offer no protection to the contents, and take up unnecessary space. ✅ DOUBLE PACK - We provide two pouches so you can protect an additional key in your household. Please remember to also keep your SPARE key protected. 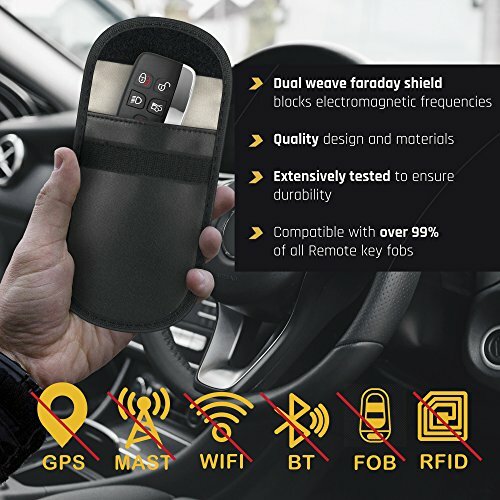 ✅ COMPATIBILITY - Cloakmate Signal Blocking Pouches are compatible with over 99% of all Remote Key Fobs. ✅ SATISFACTION GUARANTEED - We are a UK based company aiming to provide the highest level of SERVICE to our customers. If you're not satisfied for any reason, we offer a 100% MONEY BACK GUARANTEE, no questions asked.